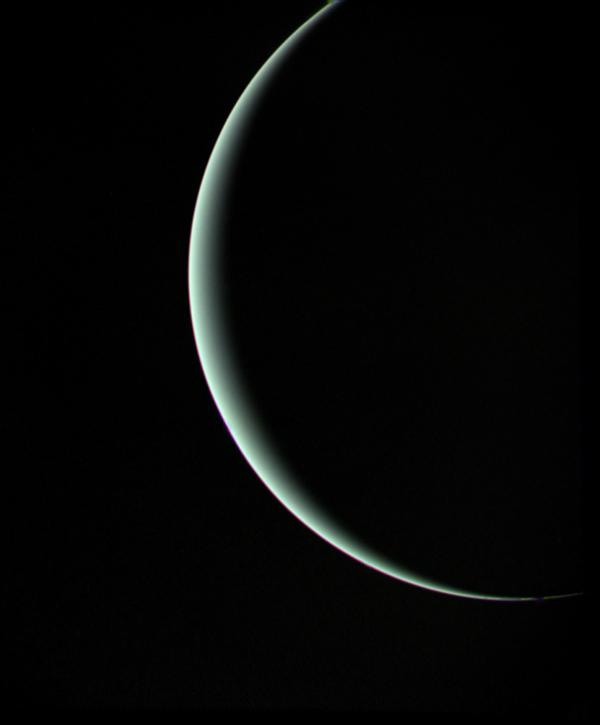 On January 24th, 1986, Voyager 2 swept past our system’s seventh planet, Uranus, on its way out of the solar system. It was the first and last time we visited the gas giant, and we found it’s one of the stranger locations in our solar system. Throughout classical times, scholars recognised only six planets: Mercury, Venus, Earth, Mars, Jupiter and Saturn, each visible to the naked eye. It wasn’t until the advent of advanced telescopes that anyone realised that there could be additional worlds orbiting our sun. While the planet is visible to the naked eye, and had been observed throughout history, it had been identified as a star. It wasn’t until March 13th, 1781 when William Hershel observed the planet and noted it down as a comet. “The power I had on when I first saw the comet was 227. From experience I know that the diameters of the fixed stars are not proportionally magnified with higher powers, as planets are; therefore I now put the powers at 460 and 932, and found that the diameter of the comet increased in proportion to the power, as it ought to be, on the supposition of its not being a fixed star, while the diameters of the stars to which I compared it were not increased in the same ratio. Moreover, the comet being magnified much beyond what its light would admit of, appeared hazy and ill-defined with these great powers, while the stars preserved that lustre and distinctness which from many thousand observations I knew they would retain. The sequel has shown that my surmises were well-founded, this proving to be the Comet we have lately observed”. It wasn’t until he brought his discovery to another astronomer, Nevil Maskelyne, that they realized that it wasn’t a comet: it orbited the sun like a planet. Additional observations from other astronomers helped confirm the discovery, and Hershel was given the honor of naming the planet. He bestowed it with ‘Georgium Sidus’, or George’s Star, in honour of his king. This, however, didn’t sit well with the wider European astronomical community, and in 1782, German astronomer Johann Elert Bode proposed Uranus, the latinised version of the Greek god Ouranos. However, it would be decades before the name was widely used. The discovery of a new planet was Earth-shattering news in the astronomical community, and would open up a race to discover new bodies within the solar system. Over the coming century, astronomers made a number of observations that confirmed the planet’s orbit, five moons, a set of rings, and its unusual orientation: unlike the rest of the planets in the solar system, it had an axial tilt of 97.77°, with one pole facing the sun. 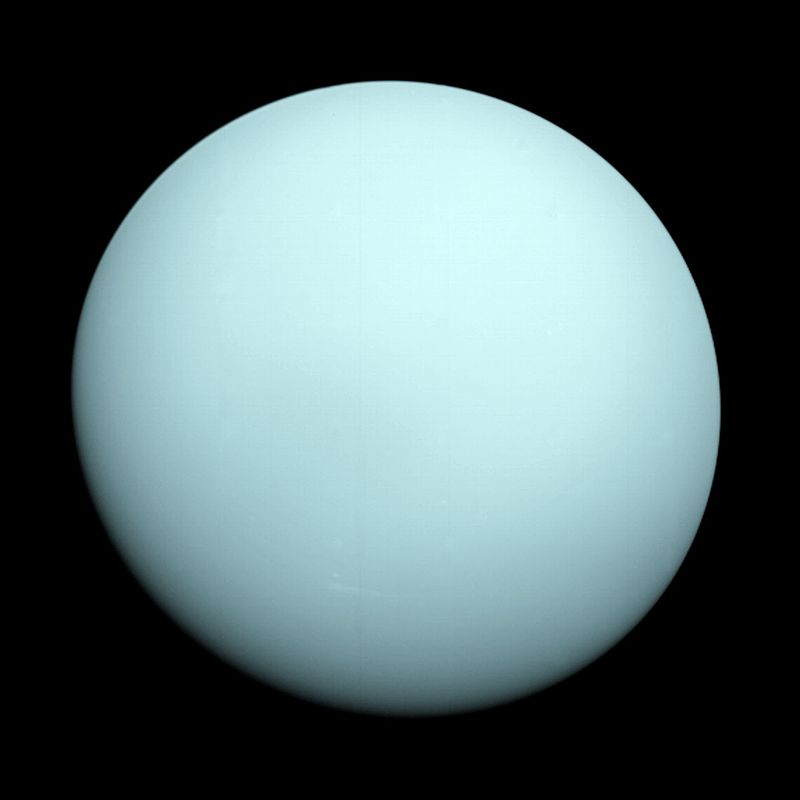 However, it wasn’t until the 20th century that Uranus got the most attention from astronomers. This was the first step in realizing a new space program, one that would eventually explore the outer solar system: Voyager. It was an ambitious project, and two spacecraft were developed for a grand tour of the outer solar system. In 1977, both spacecraft blasted off and made their way towards Jupiter: Voyager 1 on September 5th, flying by Jupiter and Saturn before it made its way out of the solar system. Voyager 2 launched on August 20th, and flew past Jupiter, Saturn, Uranus and Neptune, before it left the system. On January 24th, 1986, Voyager 2 reached its closest point to the seventh planet, 50,600 miles above its surface. While there, it uncovered a wealth of new information about the planet: in addition to examining the previously discovered moons Miranda, Ariel, Umbriel, Titania and Oberon, it discovered a number of others: Cordelia, Ophelia, Bianca, Cressida, Desdemona, Juliet, Portia, Rosalind, Belinda, Perdita and Puck. The probe also discovered interesting things about the planet’s atmosphere: it was extremely cold, with a composition primarily of hydrogen and helium. Among the other discoveries was that the planet’s magnetic field behaved strangely. The encounter lasted all of 5.5 hours before Voyager departed, on its way to the next planet in the solar system, Neptune, helped along by a gravity assist. Since then, we’ve continued to learn about the planet: we’ve seen auroras in the planet’s atmosphere, while we’ve also recently learned that the planet’s atmosphere is heating up dramatically. There’s still a lot to learn from it. To date, no other probes have been sent to Uranus, but there have been several proposed missions, although none have been ranked as highly as missions to planets such as Mars, Jupiter or Saturn. As of 2015, NASA has begun considering a new mission, one that would launch in the 2020s. Another mission to the planet would likely need to include an orbiter, which would provide detailed information about what is still a mysterious planet.